"What you're doing, it's just plain wrong! To us Beybladers, our Blades are what represent us in battle, win or lose. We fight together, we win and lose together, we even fix them together! How dare you take them away from us!" 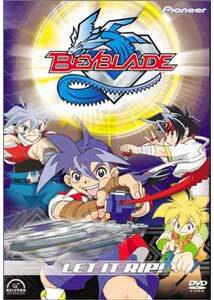 Beyblade has perhaps the stupidest premise of any television series ever created. You see, a "beyblade" is basically a top. Two Bladers "face off" by launching their little plastic tops into a little arena and letting them "battle" until one is knocked out. Like Pokemon, there are Beyblade tournaments and rivalries and so on. Tyson is a hot-shot Beyblader until the day he faces off against Kai, leader of the elite Blade Sharks, a gang of rough-and-tumble pre-teens who will stop at nothing to win, and who will even trash another dude's blade (OMG!). Kai destroys Tyson's treasured Blade, so he decides to rebuild. It is then that he learns that certain Blades (called Ultimates) are inhabited by "Bit Beasts" that can control the Blade after it has been launched. Sample beasts: lions, bears, and dragons! At times during the fight, the spirits of the beasts leave the blades and battle, and the show spins off into new dimensions of absurdity. Whatever. Conveniently enough, Tyson has some sort of family history involving a sacred dragon sword, so he is able to put together a really sweet top that can spin really well, and he joins a tournament to take on Kai once and for all. Yawn. No, seriously. I fell asleep twice trying to get through these six episodes. I realize this show was produced for kids, but that's no excuse for the idiocy. I've already mentioned the premise. The show follows the same format as Pokemon, but is nowhere near as entertaining. That show has a sense of humor about itself, with quirky dialogue and some oddball side characters. Beyblade is always ultra-serious, and the characters act as if these toy battles are the be all and end all. The dialogue is pretty terrible too. It's supposed to be hip and funny�Tyson's grandpa uses lots of slang and there is a talking computer with a crush on the young Blader�but it's never better than wince-inducing. The animation quality is decent, though the character designs are less than impressive (particularly the one whose entire face is covered by his hair, including his eyes, so he just puts his glasses on over his hair). The Beyblade battles all look the same, but then, there's not a lot that can be done to make spinning pieces of plastic bumping into each other look interesting. My review copy came packaged with a Beyblade and a mini-arena, and I can at least say that the toys are even less entertaining than the show. I can't imagine the disappointment kids will feel when their parents finally cave in to their begging and buy them a set. Only then will the tykes finally realize that they are watching a boring show about tops, and that the real things are very rarely inhabited by the ancient spirits of mythical creatures. Image Transfer Review: Image quality is pretty good. Colors are nice and bright and show no cross coloration. Detail is good, and artifacting isn't a problem. Perhaps the image isn't as vibrant as it could be, but it's still a very clean presentation. Audio Transfer Review: Only a dubbed 2.0 English track is included, but I doubt there was much of an audience for the original Japanese anyway. The included mix is fairly unimpressive. Everything is confined to the front soundstage, which presents the audio as basically as possible, with most everything going through the center channel and no directional effects or panning. The dialogue is clear, though. Extras Review: No extras are included, save subtitles. Aw, no toy commercials this time, Pioneer? Beyblade, Beyblade, Beyblade, toys made by the Chinese. Beyblade, Beyblade, Beyblade, each sold separately! Really, I know that shows designed to sell junk to kids are nothing new, but Beyblade is a new low. Hasbro, I'm ashamed of you. What happened, man? You used to make G.I. Joes. You used to be cool.